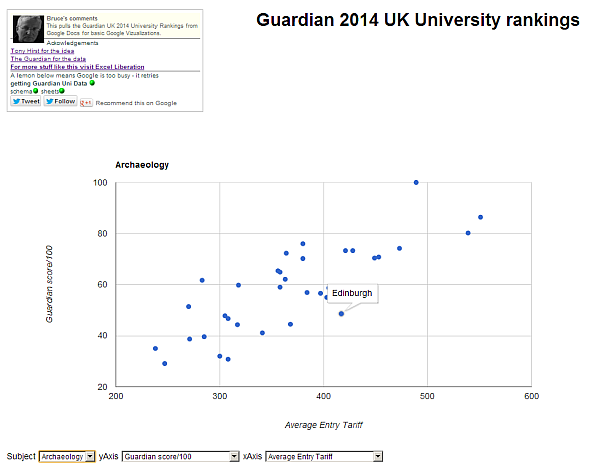 Using the Guardian UK university 2014 rankings to demonstrate, here's how to mashup a few bits and pieces to visualize them. This is pretty generalized, so can be applied to any data set with fairly minimal changes. I'll be using these technologies and concepts, all of which have been covered in some way on this site. Thanks to Tony Hirst, where I first saw this dataset on his oUseful blog. You can find it here, and embedded below. 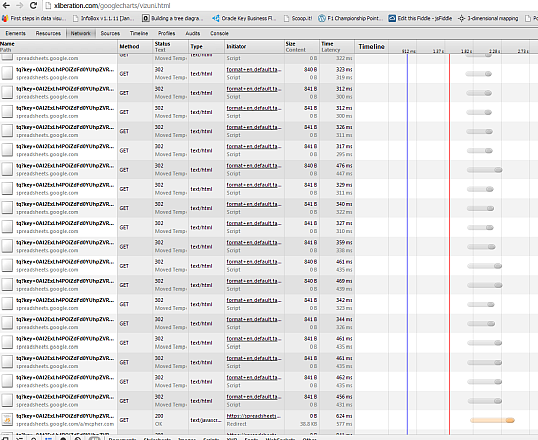 The data is spread across many Google Docs Spreadsheets so it takes a while to load. The source data is a Google Workbook with about 50 tabs. In this implementation we have to first get the schema for the workbook. This will tell us what worksheets to retrieve, along with the variety of fetch URL needed to get the data in a format suitable for input to a Google Visualization DataTable- which allows us to retrieve each sheet as follows. Simply use a selector with values that correspond to the column number in the source table, and create a view with those selected columns from the underlying datatable. Since each sheet is treated separately, there is no need for them to be in the same format or even have the same columns - the selectors and viz are completely data driven.